the harm caused to mothers and their fetuses by smoking during pregnancy. the unsustainability of a business model based on renting pages in an airline seatback catalogue to the manufacturers of secondhand smoking fetus dolls. 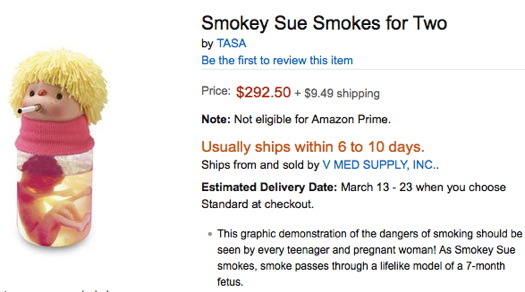 the balls it takes for someone to buy a Smokey Sue on SkyMall and turn around and flip it on Amazon for nearly twice the price.